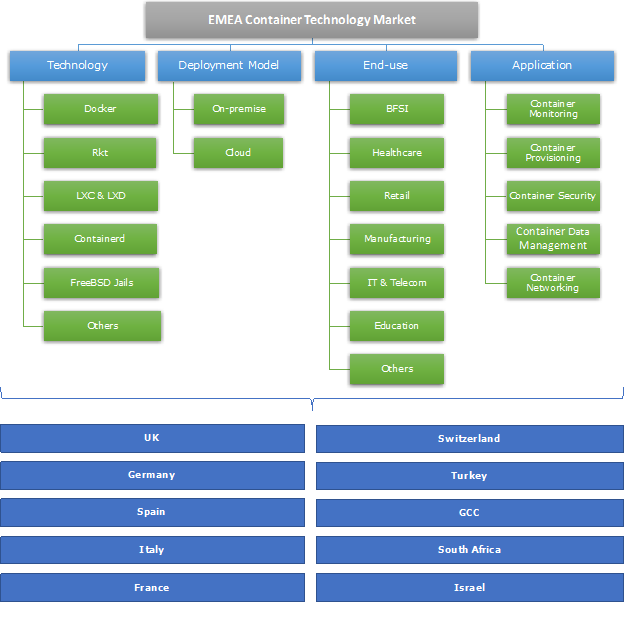 EMEA Container Technology Market size was estimated at over USD 200 million in 2016 with a CAGR of over 35% from 2017 to 2024. The EMEA container technology market is gaining momentum due to increasing adoption of the technology by European countries to modernize their IT infrastructure and improve operational efficiency. With stringent regulations for protection of data belonging to the businesses operating in the European Union (EU), many cloud and datacenter service providers are establishing cloud centers in Europe. This has resulted in accelerated adoption of container technology by the local enterprises to efficiently deploy their applications in the cloud. With many large global players such as IBM and Microsoft focusing on aggressive expansion in the region, the competition is expected to become fierce over the forecast period as new entrants make their way into the market. Moreover, government in the region are also leveraging the benefits of cost-saving and improved operational efficiency offered by the technology to improve their IT infrastructure by moving to cloud-based storage and application processing. In Europe, Docker is expected to dominate the market in 2024 in terms of revenue with a share of over 75% owing to its increasing adoption as the most fundamental container technology supported by many major cloud service providers. Companies are emphasizing on enhancing their support to run Docker containers efficiently on their platforms. With emergence on new startups focusing on effectively orchestrating numerous Docker containers, the technology is anticipated to exhibit promising growth during the forecast period. MEA Docker technology market is also expected to hold a significant share of over 70% in the coming years. This dominance can be attributed to increasing inclination of enterprises towards cloud-based computing to achieve efficient scalability in their operations for meeting their changing IT infrastructure requirements. Rkt framework, being the prime Docker alternative, is expected to register fastest growth in this region during the timeline due to its growing popularity for improving container security. Container data management is expected to hold a significant share of the European container technology market by 2024 with large scale adoption of container orchestration platforms such as Kubernetes to efficiently manage deployment and execution of clusters of multiple containers. Security segment on the other hand is expected to exhibit highest growth rate of nearly 35% between 2017 and 2024 owing to increasing concerns over the security of mission critical data deployed in datacenters over cloud networks. In the MEA industry, container networking will experience fastest growth over the forecast period due to increasing emphasis on improving container-to-container and container-to-host connectivity. On-premise deployment model is expected to dominate the Europe container technology market by 2024 due to the reluctance of enterprises to switch from their reliable on-premise infrastructure to cloud. On the other hand, the cloud deployment model will register fastest growth over the timeline as increasing number of enterprises are adopting cloud based model to benefit from associated scalability and cost-effectiveness. Cloud deployment model is expected to dominate the MEA market during the forecast timeline with increasing number of emerging players adopting cloud deployment to reduce their infrastructure expenditure making it the fastest growing deployment model in the region over the timeline. The BFSI sector is expected to hold a significant market share in the European market owing to increasing demand for effectively running and managing large number of enterprise applications simultaneously. Telecom and IT sector on the other hand, is expected to exhibit fastest growth during the timeline due to increasing penetration and advancement of internet and telecom networks giving rise to increased number of application workloads and microservices. Similarly, in the MEA region, the BFSI sector is projected to dominate the market whereas telecom and IT sector will witness the fastest growth with the highest CAGR between 2017 and 2024. 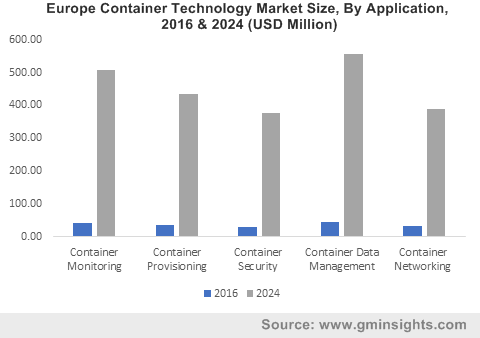 UK application container technology market is expected to hold the largest share in the European industry by 2024 owing to growing preference of businesses containers to modernize their IT infrastructure. Due to favorable government initiatives to promote the adoption of cloud-based solutions, UK is expected to witness the fastest growth over the forecast period. In the MEA market, the GCC is expected to hold the largest market share in 2024 due to increase in investments by government and private firms to increase operational efficiency. Container technology market is moderately competitive with few key players occupying majority of the market. With increasing popularity of containers for OS-level virtualization, companies are focusing on delivering advanced capabilities to the customers to effectively create, deploy, run and manage containerized applications. The key strategy followed by the market players is product development and innovation to strengthen their product and services portfolio. The infrastructure providers are emphasizing on business expansion to enter into untapped regional markets. Some of the players present in the market are Docker, Mesosphere, ClusterHQ, AWS, Joyent, Microsoft, The LINUX Foundation, Cloud Foundry, CoreOS, IBM, HP, VMware, and Cisco. Container technology has emerged and evolved as a cost-effective alternative to virtual machines over the years. With increasing need for virtualizing resource-intensive workloads, containers offer OS-level virtualization, eliminating the need to encapsulate an OS instance with every VM. This has led to large scale adoption of containers for virtualizing huge volumes of application workloads with less hardware investment compared to VMs. As more enterprises will move to cloud-based applications and datacenter service, the demand for container technology market and management services will increase considerably.